I've never had to grow flowers for a wedding or any special event, nor do I plan to. But before we all turn away thinking that this book is for those who are insane enough to add growing the flowers to an unending list of things to do when planning a wedding, let's take a closer look. 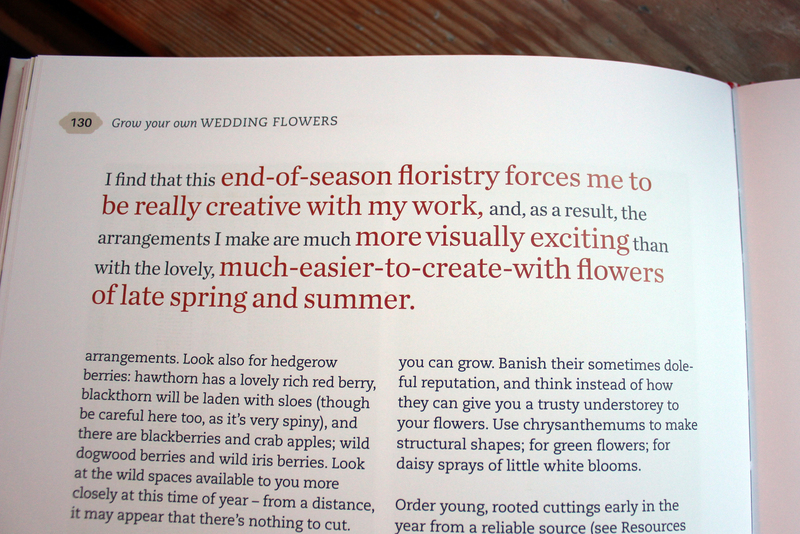 This book has so much potential to get even the most humble flower grower excited. I resisted accepting this book for review but I'm now thrilled that I caved in. On my first read through, I thought of all you "In a Vase on Monday" blogger gardeners - wow, wouldn't your Monday vases be (even more) awesome after reading this, the inspiration on these pages had even my veg-hardened heart beating faster. In fact I'm mentally clearing over half my planting space for flowers now. There, said it. But just imagine, weddings aside (because I hope that that's a few years off in my life and that of my 20 year old) that you know you've got a special event coming up next year: Old friends visiting from afar, a landmark family party, a community shindig or you just want to put spectacular arrangements in the local church on Sunday and you want beautiful flowers to make the day. Of course you can go and buy them (at huge expense) or you can grow your own. Do you just sow seed in the springtime and hope for the best? Or, more cleverly and in a far more organised fashion, do you choose the flowers that you want blooming in your garden at a specific time of year and work backwards from there? With this book you can choose to do the latter. Yes, it can most definitely be done. In case you haven't rumbled me yet, I am actually very impressed with this book. 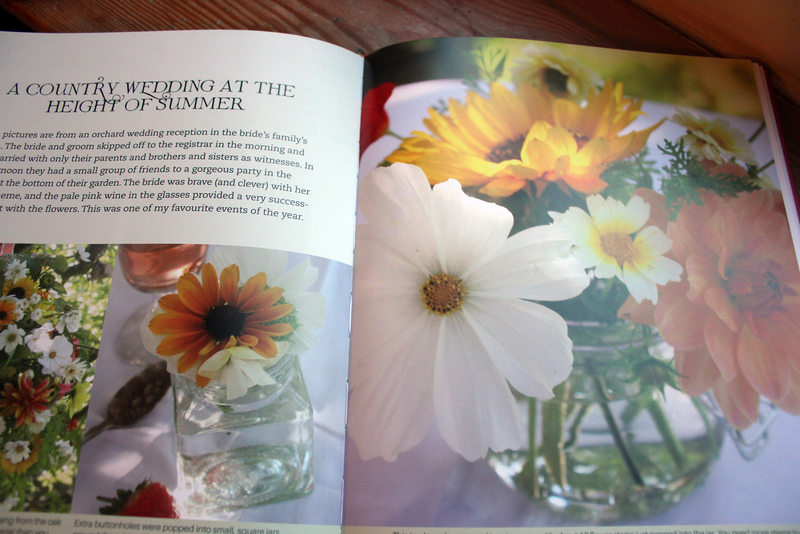 All the information that anyone could need is comprehensively included within, which is not surprising as the author, Georgie Newbery of Common Farm Flowers, grows flowers for an average of 50 weddings a year. Just imagine that. Brides and their mothers all a-quiver that everything should be just perfect on the day and all that responsibility resting on Georgie's shoulders. We can take it that she knows whereof she writes. So, apart from a blindingly good read, what do you get? The book is divided into three parts, an introduction, an afterword, appendices for plant names and a season planner and a resources section. Part Two: Planning for your wedding (or event) - spring, early summer, high summer, autumn and - awesome!- even winter. Part Three: This is the section where you'll learn how to make bouquets, buttonholes, table centrepieces, garlands, a flower crown and even fresh petal confetti. Georgie Newbery has not only managed to compress all of this information into a wonderfully flowing read but has written it in such a way that all of her vast experience is presented in a way that would empower a complete novice to have a go. No detail is overlooked. Why, there's even a table at the end which lists a huge choice of flowers with their names (common names included), suitable growing conditions, growing and cutting times, what time of year they're at their best and other snippets of useful information. Georgie is generous with her anecdotes and folklore which I found very engaging but also makes the whole vast undertaking seem eminently achievable which is surely no mean feat. Consider this book an investment if you have a wedding to plan for; otherwise, flower arrangers should draw inspiration from the suggestions in the book using wildflowers, hedgerow, cutting patch and what's in the garden already. I think this is a book that will be both a brilliant winter read and an excellent reference. I give it a big thumbs up and might just have to rethink my whole seed list for next year. UPDATE: I went along to the launch of this book last night and learned from Georgie that wedding flowers account for a huge percentage of the floristry industry (I seem to recall £9.2 million being mentioned but I did have a glass of champagne in my hand at the time). 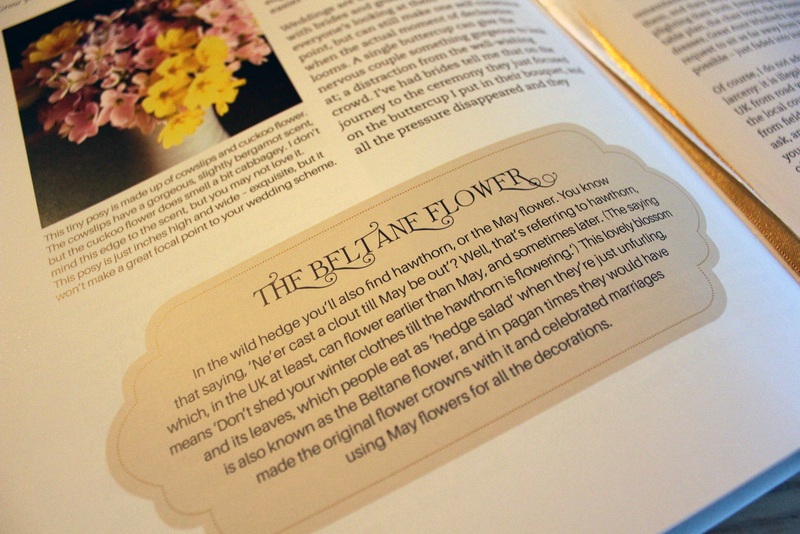 Brides are keen to have British grown flowers rather than hothouse flowers flown in from abroad so this book is a very timely publication for the British Flower industry and amateur growers that want to grow their own. And how satisfying to know that you've been able to contribute, even if it's just the buttonholes or a centrepiece for your parents' golden anniversary or the flowers in church for a christening (as I suspect I am shortly going to be doing!). Seriously, this book is great. My thanks to Megan at Green Books for providing me with a copy of Grow Your Own Wedding Flowers by Georgie Newbury for review. If you want to order a copy, the book is on the Green Books website here for £24.99 or in the usual alternative outlets. What a lovely book! I love the idea of growing the flowers for your own special event, be what it may. I often find the fun (as well as the stress of course, but anyway) is in the planning, so this would be no different. The planning is done for you in this book, Bek. Georgie is amazingly organised and has passed on all that she knows in this book. Definitely one for giving confidence to even the most tentative of wedding flower growers. 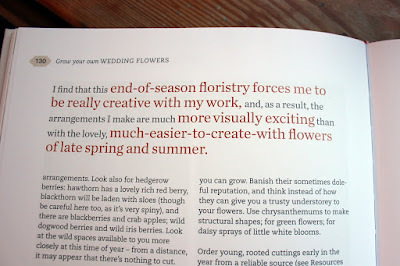 Yes I too loved this book and I found it packed with inspiration for a cutting garden. My seed list for next Spring has been hugely influenced by Georgie Newbery's enthusiasm and expertise. I saw that you'd reviewed it Sue and tried not to read your review before writing my own! I think my seed list will also change - and I mentioned the book to my niece who has a christening coming up so I think Georgie's sound advice may be put to good use soon! I believe it to be an excellent addition to my gardening bookshelf. Maybe if it didn't specify weddings it would have a wider audience may be something like flowers for all occasions. I agree, Sue. As I read it, I thought of all the possibilities for other events, not just weddings. However, weddings are the mainstay of Georgie's income and, as I learned last night at the launch, wedding flowers are the mainstay of the floristry industry but brides are increasingly wanting to buy flowers that have not been flown in from abroad. 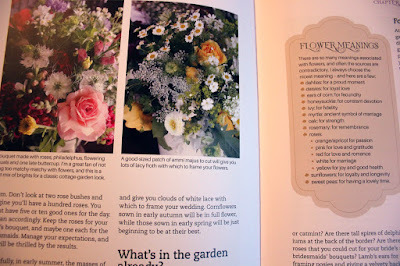 I liked the idea of working out which flowers you want and working backwards from there; the book also has lots of very specific advice for individual flowers so is an excellent all rounder. As would a lot of people, Dina - my copy has already gone to my niece who is wondering what flowers to have for a christening next year, and I read on Georgie's Twitter feed this week that her book has already sold out at Amazon - amazing! 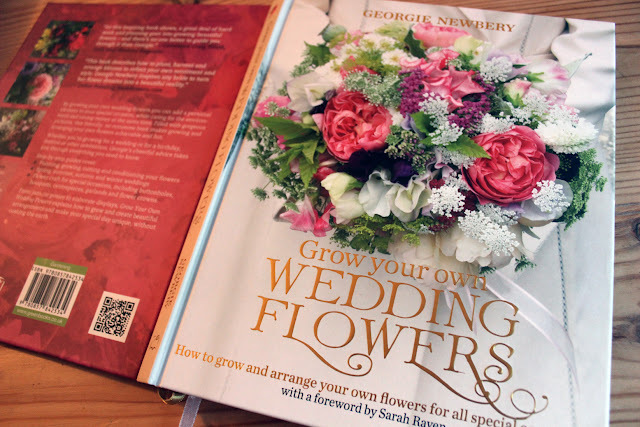 I would have probably walked past this on the library shelf but your review - well, there is something in there for anyone who likes growing and arranging flowers, not just for weddings. and the pictures look so pretty! the author's 'buy local' sentiment is also to be applauded. pretty and ethical - full marks! Absolutely, buy local is totally the way to go (and grow!) I resisted reviewing it for ages - mainly because I'm not a rose grower or a wedding florist - but I'm so pleased I did accept a copy in the end, it's a good read as well as having lovely inspiring photos. Hi Caro, Anna recommended this book to me because she knew Younger Daughter had asked me to do her wedding bouquets next year. I noticed from her blog that you had reviewed it so popped over to have a look - most helpful. As you say, it sounds useful for more than just weddings. Although I have got bulbs and sweet peas on the go for the April wedding I have had to guess at timings, so it could be helpful to read Georgie's insights on that and I will look out for the book. Thanks for the review.